you can book a cruise for meetings and incentive groups. 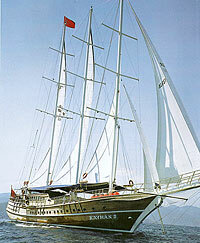 BLUECRUISE.ORG is a German-Turkish company based in Bodrum right on the Aegean coast. 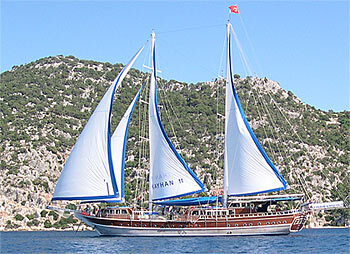 We offer an attractive variety of gullets and itineraries to suit the individual needs of our guests. All information provided here is based on first-hand knowledge and our personal contact to the boat owners, which enables us to know always ‘what’s going on’. These three KAYHAN boats are meeting all the demands of the discerning clientele for a nostalgic and romantic cruise. At the same time they offer all the comfort you would expect to find on your very special holiday. These luxury gullets have 9 or 10 cabins with comfortable double or single beds. Your bath here is large and spacious, each has a shower cabin and the toilets working with the flush system, just like the ones you are using at home. All cabins have air condition which can be run for several hours daily during naps or when preparing to sleep for the night. For guests who visit us in the cooler months,this AC system also works with warm air, like a heating system. You will experience the sun of the Aegean, the sea breezes and the proverbial hospitality of the people. The coast of Turkey, with its deep inlets, wide gulfs and sheltered bays, and the nearby Greek islands, is a unique holiday region. The pleasant climate, crystal-clear water and the delightful, always-changing scenery of the Eastern Mediterranean are waiting to welcome you. turquoise-coloured bays than the M/S KAYHAN crew invites you to have a go at kayaking windsurfing or even waterski. You can snorkel to your heart's content! In the months which are not so warm, walks to ancient places or to nearby typical villages are the favourite pastime. On request, the captain will also organize excursions to points of interest and ancient cities either on the coast or inland. The Captain knows each harbour and every cove. 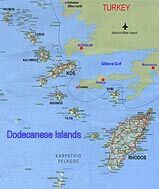 The cruise will follow a fixed route which will be discussed with you and your group. On board of the KAYHAN you will be served the famous Turkish cuisine - dishes, prepared using the freshest vegetables, fish and meats. Our cook is an expert in his field. He will pamper you with three meals a day: breakfast, lunch and a dinner. We will serve dishes often based on seafood. If you are skilled in diving and fishing, there is a good chance to add your catch - but if you are not lucky enough, don't worry... we will get always fresh sea food from the fishermen passing our boat. If you have any special dietary requirements (if there are certain foods you dislike or mustn't eat), simply let him know. It will be a pleasure for him to prepare dishes to suit your exact taste. Soft Drinks and alcoholic drinks are extra, we can buy them at supermarket prices. Meals are mainly served on the aft deck under the awning which protects you from the sun. In cooler months, our guests may dine in the deck saloon. for your fun we have 2 canoes, fishing and snorkeling gear. There is nearly none of the gullet charter-companies who tells you the truth about the use of air-condition on Gullets. Yes, yes, all of the KAYHAN boats have AC and you think you can switch it on when you like. It's not! On a boat the AC can only run when the generator is on, or in a harbor when connected to 220 Volt. But mainly you are in anchor bays, often next to a neighbor who doesn't like the noise of your generator and you wouldn't like it either during the night for example. - So most of the gullets have come to a gentlemen's agreement not to disturb each other - AC can be used on the most of the boats 2-3 hours in the morning or at night from 20 to 24 hours. Your Itinerary: You may start your journey either in Fethiye/Göcek, Marmaris or Bodrum, or even Kemer/Antalya, we can plan and arrange it with you, depending where you wish to go (map here) or according to your chosen airport, Bodrum, Dalaman or Antalya. but flights we do not arrange. Designing a meaningful cruise incentive award is unquestionably one of the best ways to increase company loyalty and boost moral. Frankly, nothing motivates people to work harder than the thought of not having to. And although a land-locked resort is great, where's the excitement of travel? The romance of the sea? The thrill of discovery and adventure? There just isn't a better way to motivate people to work harder than the thought of an exotic, luxurious, relaxing cruise to exciting destinations. What's more, costs are easier to control on a cruise. And of course, like all our boats, also the M/S KAYHAN gullets are meeting international safety regulations including life jackets, fire extinguishers and alarms. © pixelwork bodrum 1998-2008. (updated for 2008) All Rights Reserved.